Goals and assists in Champions League for PSG against Barcelona for Zlatan Ibrahimovic. Meanwhile, speculation about Zlatan’s future and from Italy it is now reported that there is not only interest from Juventus interest but increasingly also from Napoli. Already earlier this year, TVZ reported on the Italian club’s interest in Zlatan Ibrahimovic. In January this year, Zlatans agent Mino Raiola also said that Zlatan would someday like to play for Napoli and at San Paolo, his dream arena. Now it is reported that club management of Napoli follow Zlatan with increasing interest. 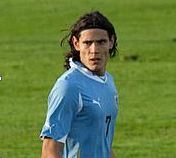 According to information from La Republica, Napoli want a truly great star, a profile of the highest caliber, if Cavani is sold. – They will do anything to keep Cavani, but if he does not stay, then Napoli have to get a really heavy new name directly when, otherwise the fans will be crazy, says football expert Enrico Curro. According to the newspaper club president De Laurentiis believes that the deal would be economically feasible. They also speculate whether a change between PSG and Napoli, where the PSG buy Cavani in exchange for Zlatan plus about 40 million to Napoli. – The fans would love Ibrahimovic, it would be huge, says Enrico Curro. This entry was posted in Rumors on March 20, 2013 by Johan Bengtsson.